This was an apt title for an amazing concert in Ely Cathedral featuring a massed choir of young singing enthusiasts. Who says the young never do anything? These young people have obviously practised many an hour to achieve such a wonderful sound and under the baton of Paul McCreesh, gelled together wonderfully to present many works of the church repertoire from Gabrieli’s time in the sixteen and early seventeenth centuries and some well known ones from later eras. These compositions needed a special understanding and approach to bring out the beauty of the music of their time. From the opening plainsong ‘Ave Maris Stella’ that floated high in the cathedral vaults as the voices from the back of the church slowly moved forward to under the octagon, it was obvious that this was going to be a splendid evening. The other works presented were by Felix Mendelssohn, Christopher Tye, Samuel Wesley, Edward Elgar, John Sheppard, Robert White, Herbet Howell and Thomas Tallis. Christopher Tye and Robert White were wise choices for they both had worked in Ely Cathedral. At the full climaxes, the music did indeed ‘roar’ and these singers also created exquisite moments of contemplative reflection, charming beauty, and gentle resonance as the voice parts echoed each other and intertwined. The magnificent choirs gathered together included The Gabrieli Consort with Bradford Catholic Youth Choir, Cantante, Hertfordshire County Youth Choir, Inner Voices, London Youth Choir and Taplow Youth Choir. The highly competent organist was William Whitehead. The Cantata Eliensis tells the story of the building of Ely Cathedral. The librettist, Nick Pitts-Tucker, used original sources as his inspiration and the music was well-designed to reflect the chants and harmonies from the twelfth century while incorporating more contemporary effects that coloured events wonderfully. The three composers Anna Krause, Toby Young and Louis Mander produced some intriguing sounds which gave the story life and substance and which would not have been possible without the expertise of the very fine musicians. We could feel the mysterious eeriness of the Fens, we experienced the horror of battle and marvelled at the portrayal of quarrymen, layers, carpenters and masons at work. Although a modern instrument, the improvised nature of the saxophone part interwove within the texture fittingly. Under the baton of Kate Bullimore Cantata Dramatica soloists and chorus expressed the music with accomplished conviction leaving the audience with a sense that it had indeed experienced what it must have been like to build such a magnificent building in those times. It was fortuitous that the Director of Music at Ely Cathedral had heard the work before in Grantham and the Lady Chapel of Ely Cathedral was a most appropriate place for the powerful open harmonies resounding against the stark stone of the surroundings. ‘A Summer Celebration’ in Ely Cathedral last Saturday must be one of the major highlights of the year and it certainly celebrated the 10th anniversary of the Ely Cathedral Girls’ Choir magnificently. The performers included Ely Cathedral Girls’ Choir, Ely Cathedral Octagon Singers, The Ely Imps, The Ely Celebration Orchestra (led by Emma Gait) and famous guests Lesley Garrett (soprano) and John Rutter (composer and conductor). With a line-up like this, success was inevitable and it was no surprise that the cathedral was packed. The quality of performance was undisputed and from the spine-tingling opening when the massed choir began to sing Zadok the Priest, there was not a moment that did not fill the cathedral with wonderful sound. After Sarah MacDonald led the massed choir singing ‘Zadok the Priest’ the girls, boys and men’s choirs sang the other Coronation anthems: ‘The King shall Rejoice’ and ‘My heart is Inditing. Sarah’s conducting was exceptional. John Rutter is an inspiring composer who writes music that is both delightful and accessible and the pieces he chose for The Ely Imps were ideal. They included ‘Magical Kingdon’, ‘Look at the World’ and ‘For the Beauty of the Earth’. Under his baton the young singers sang beautifully, their voices clear and the music expressive and heart-warming. Asked what the secret of good composing is, John Rutter immediately replied: ‘Believe in it and study hard.’ This is wise advice from what must be one of the world’s most renowned current composers. Equally famous Lesly Garrett joined the singers in ‘Laudate Dominum’ by Mozart and Stanford’s ‘Magnificat in G’ both of which were conducted by Sarah MacDonald. Needless to say, the effect was utterly stunning. Beethoven’s ‘Mass in C’ was chosen to close the evening and the performers rose to the occasion wonderfully. Under Paul Trepte’s directorship they fully explored Beethoven’s quieter reflections, contrasts, intensity and changes of pace. The soloists were excellent and included Tara Bungard (soprano), Karl Read (alto), Mark Hounsell (tenor) and Jonathan Midgley (bass). For Tara this event was a real family affair for present in the audience was her mother, Sue Freestone, (Principal of The King’s School Ely where the choristers attend) who proudly admitted that her grandchildren were also performing as members of Ely Imps. This was indeed a unique, splendid evening that would be nigh on impossible to surpass. After the inaugural event of the Isle of Ely Arts Festival this year, when they presented a workshop to budding young cellists, these highly talented musicians gave a concert in Ely Cathedral. The programme was varied but the performance was constant: a performance that can only be described as outstanding. Their phenomenal technique was immediately apparent as they varied the sound and touch very effectively. Guy produced some of the most musical and precise sounds I have heard from a ‘cello. His prowess was exemplified by agility and clarity in the Bach, amazingly powerful and well balanced double-stopping in the Turnage, sheer beauty and sonority in the Mendelssohn, notable intensity and sensitivity in the Schubert, potent bowing in the Chopin and very moving expression in the Fauré. His talent was well matched by Melvyn Tan’s piano playing. Melvyn accompanied with real empathy as the need arose and in the Chopin particularly, his fantastic flair and virtuosic agility were unforgettable. 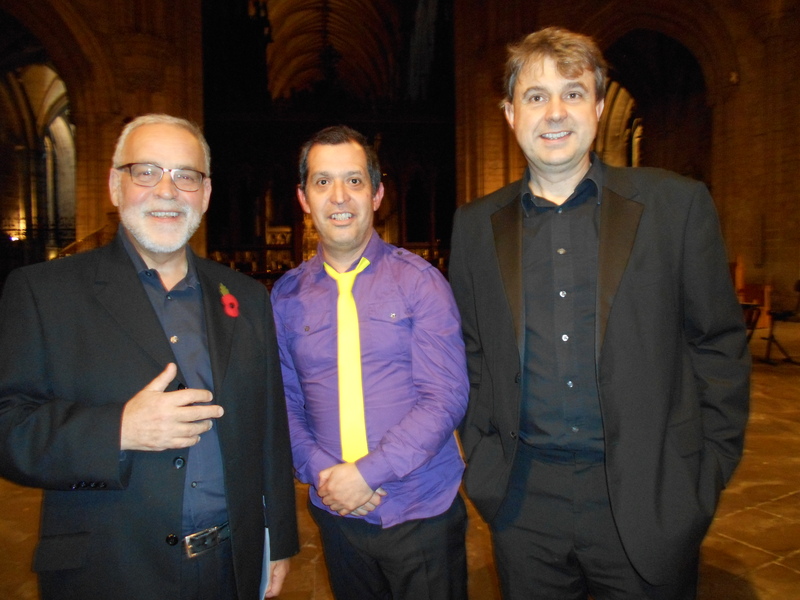 This was an excellent concert, giving the Isle of Ely Arts Festival a tremendous start. 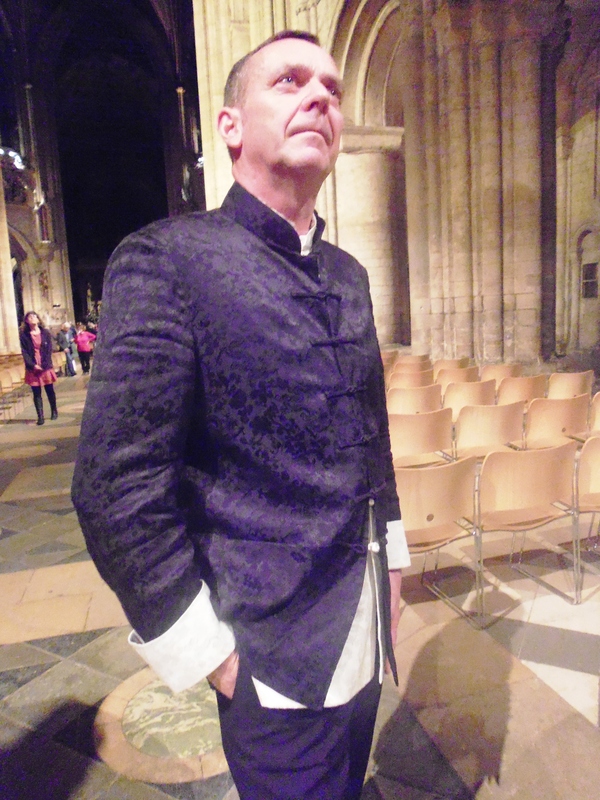 Ely Choral Society, Hertfordshire Chamber Orchestra and soloists under the baton of Andrew Parnell presented music of a very high standard in Ely Cathedral on Saturday. These admirable soloists included soprano Elisabeth Rauch, mezzo soprano Chloe Latchmore, tenor Daniel Joy, and bass William Gaunt. Our own Assistant Organists, Edmund Aldhouse, provided assured accompaniment on the organ in this fine orchestra. The pieces performed were Schubert’s ‘Mass no 3 in B flat Op. post. 14’ and ‘Stabat Mater’ by Rossini. These two works provided excellent balance to the programme, the composers’ styles being so different but effective in their own way. The Schubert contained many moments of reverence, joy, sadness and warmth. His lyrical beauty was very much in evidence. Choir, orchestra and soloists were splendid, bringing out the most expressive parts really effectively and under the conductor’s clear signals were able to work together extremely well to produce the type of sound that left us wanting more after the last notes of the ‘Dona nobis pacem’ faded away into the magnificent building of Ely Cathedral. Rossini, known for his operatic approach to all things, contrasted the very pleasant tuneful style of Schubert, with something more varied, and more contrasted. Although we may be used to more sedate constraints in church music, the sweeping gestures of the arias and the sudden dramatic changes of volume in this work were well placed – for how else to express emotional trauma at its highest? What the composer achieved here was to use his musical know- how to incorporate traditional elements, such as the beautifully sung unaccompanied sections, with his expertise in expressing reflective emotion in the arias. There is no doubt that the phenomenal ability of the musicians and the superb conducting by Andrew Parnell made this concert was of their best. More of this please! Ely Cathedral is the ideal place if you want to make a big noise, so when I saw that ‘Prime Brass’ were performing, the group seemed just right for the concert on Saturday. However, there was much more that some fantastically powerful sounds that these brass players could muster, there were many moments of highly professional precision, expression and sensitivity. This was no run-of-the-mill programme either. In between very pleasant and the well executed items that were expected there were recent compositions of the more expansive and complicated type. The evening opened with ‘Spirit of the Age’ by Arthur Bliss conducted by Paul Trepte and immediately Prime Brass, demonstrated real craftsmanship. The precision, variation in the dynamics (louds and softs) and the way the instruments blended their sounds were most impressive. This was followed by a real star of the evening:‘Symphony V1½’ written especially for tonight’s concert by Geoffrey Alvarez. Paul Trepte’s phenomenal conducting was evident when the composter told me that he was particularly impressed with the precision of the rhythm: – not an easy one to engage with, as it was based on a 6-beat pattern. I know Paul got it just right when I saw the composer so engrossed with the work that when the climax finally came he was nearly out of his seat. While I can’t pretend to have understood the significance of every note, I was fascinated by the sense of celestial grandeur, occasional spikiness and moments of abandonment especially when the mambo percussion came to the fore. I was also amazed when the composer noted on Facebook that Edmund Aldhouse, our very own assistant organist (who played particularly well in this concert), pointed out that there was one bar discrepancy between Alvaraez’s symphony 6 for brass band and 6½ for brass and organ. Now that’s musical genius! Other delightful compositions followed, including works by Morten Lauridsen, Eugène Bozza, Johann Sebastian Bach, Edvard Grieg, Benjamin Britten and Camille Saint-Saens. Another contemporary composer who was at the concert was Peter Dickenson and his work ‘Fanfares and Elegies’ was another star of the night which contained great moments of contrast and extremes. This concert also featured Junior Prime Brass conducted by Christpoher Lawrence and they were a fine testament to the future, performing will noticeable warmth and aplomb. This was indeed a grand event. On entering Ely Cathedral for my first silent movie in that magnificent building, the atmosphere was both warm and inviting. I was certainly looking forward to a grand night at the movies, with musical genius, Edmund Aldhouse, accompanying on that splendid Ely Cathedral organ. I was not disappointed. For seventy minutes we were held spellbound, roaring with laughter at Buster Keaton’s antics in the film ‘Steamboat Bill Jnr.’, while Edmund’s playing rose and fell with the emotions and drama of the typical plot: gauche young boy, son of a poor steamboat owner falls in love with wealthy ship magnet’s daughter. All seems impossible for their love to blossom, but after a run of dramatic disasters and accidents waiting to happen, and then happening even more ingeniously than expected, they all live happily ever after. None of the drama, excitement and humour would have been possible without Edmund’s contribution. While he cleverly wove his own continuous texture with carefully designed motifs for the different characters, he also read our minds and as we witnessed various typical scenes, strains of music that we might have imagined ourselves drifted into the cathedral. There was the lad asleep in his bed in the morning, when I could have sworn we heard excerpts of Grieg’s composition of the same name. One of the most delightful take-offs was when Buster Keaton was battling with an umbrella in the rainstorm to strains of ‘Singing in the Rain’ woven seamlessly in the stream of Edmund’s performance. Other gems we thought we discerned were Grieg’s Piano Concerto, the Skye boat song and Don Quixote and I am sure these are only a few of them. This was a splendid idea for a different kind of organ recital and we were told this is just one of a series planned in the near future. I can’t wait to hear what is coming next. AdeC’s annual presentation of ‘Cambridge Voices’ in Ely Cathedral is always a major event of amazing quality and musicality. Last Monday night’s performance in the Lady Chapel was certainly no exception. These highly accomplished singers gave a breath-taking, inspired performance under the direction of our Cambridge musical genius, Ian de Massini. Ian has an incredible intuitive understanding of the essence of ‘real’ music, so much so, that he has the know-how and assurance to reach inside the thinking of great composers like Johann Sebastian Bach and Mahler and arrange their instrumental works for this fantastic choir to sing unaccompanied. In quiet, unassuming confidence, the choir not only sang superbly, holding a phenomenal number of different parts together from different areas in the Lady Chapel, but they reshaped their groups constantly and effectively, presenting works of considerable diversity. The listeners were spellbound and there was hardly a movement or sound from them as the programme flowed meaningfully from one work to another. Highlights for me were Ian’s own composition ‘I sing of a maiden’ and his arrangements of: Robert Wylkynson’s ‘Jesus autem transiens/Credo in Deum’ , Gibbon’s ‘Drop, drop slow tears’ and Ian’s arrangement of the finale from Mahler’s Third symphony. ’ I sing of a maiden’ was a beautiful, soft and contemplative piece, with exquisitely sustained melodies and harmonies that simply melted the heart. In the Mahler’s composition, with the orchestral version still in mind, I couldn’t help marvelling at how Ian was able to capture exactly the same emotional potency in Mahler’s soul-wrenching climaxes. With this work and his arrangements of instrumental works by Bach, Ian not only caught the nature and style of the compositions but he also took advantage of how voices can express more personal, subtle nuances that many of their instrumental counterparts cannot. The other works enjoyed were a prayer of King Henry V1 sung in the Cathedral at first and then repeated in the Lady Chapel as an encore, a number of plainsong settings that helped bridge items in this thoughtfully- produced programme and a work of considerable dramatic impact: Herbert Howell’s ‘Gloria Patri’ . There were also John Harvey’s ‘The Angels’, Knut Nysted’s ‘Immortal Bach’ and Rutti’s ‘Psalm 150’. Carl Rutti was present in the audience and gave a delightful performance of Bach’s ‘Sinfonia no. 11 in G minor’ on the chamber organ before Ian’s vocal arrangement of the same piece – an intriguing effect. Other gems included Ian’s vocal arrangement of Bach’s ‘Perpetual Canon for 4 Instruments’ and Bach’s compilation of orchestral accompaniment to Kuhnau’s ‘Triste est anima mea’. Ian also expertly arranged ‘Crucifixus’ from Bach’s ‘Mass in B minor’, and the joyful third movement from Bach’s first Brandenburg Concerto (sung to one word: ‘Hallelujah’!). This was indeed a highly captivating and enjoyable evening. It was a privilege to witness such musical genius! Review of CAST’s production of ‘The Taming of the Shrew’ in Ely Cathedral on Thursday 27th August 2015. Cambridge American Stage Tour, established in 2000 under the patronage of none other than Dame Judi Dench, is a group of talented actors, directors, designers and technicians from Cambridge University (UK) who band together to produce a play to take to schools and universities in America. Under the directorship of Kennedy Bloomer, 9 cast members delivered Shakespeare’s ‘The Taming of the Shrew’ in Ely Cathedral on Thursday night, revelling in the frolics and trickery with tremendous enthusiasm and energy. The familiar plot was ever present. Petruccio (played by Toby Marlow) decided it would be a worthwhile business proposition to marry Kate for her dowry. He ranted and railed like a wild man shocking even the feral Katherina (Kate Reid) until she became a submissive and obedient wife as planned. As he was working towards this achievement, other suitors were freed to compete for the hand of her beautiful but cunning sister Bianca (Julia Kass). In a bid to claim her affections the suitors adopted delightfully eccentric guises and invented wonderfully exotic schemes to satisfy the much tried father Baptista (Sarah Mercer) that one of them was worthy enough to gain Bianca’s hand in marriage. Needless to say, everything seemed to go wrong, but as events propelled themselves towards the final scene, all was resolved and Petruccio and Kate won the day and were an example to them all. The speed and agility of the performers made it even more impressive when we realized most of the actors had three or so different roles to play. There were some magnificent highlights: the determination of Petruccio, the facial expressions of Baptista, the camaraderie and ribaldry of the fellows, the hilarious ‘musician’ ‘tuning’ his instrument, the grotesque widow and her very reluctant partner, blokes tucking into a Take-away denying the poor starving Kate a single bite to eat: these were a few of the many memorable scenes in this highly entertaining production. Another amusing touch was the so realistic drunk who milled among the audience and pushed his way towards the stage to provide a novel way of announcing that it was the end of the interval. The remaining remarkable members of CAST included: Will Bishop (playing Lucentio/Player/Servant), Aoife Kennan (Tranio/Curtis), Will Peck (Grumio/Bartholomew/Widow), Robbie Taylor Hunt (Horensio/Servant/Merchant) and Marco Young (Gremio). This team should be a real hit in New York and Florida where it is next bound. The show returns to Cambridge in October and will be performed at the ADC Theatre from the 6th to the 10th of October. To book seats: www adctheatre.com and for more information about CAST contact: http://www.castcambridge.com.